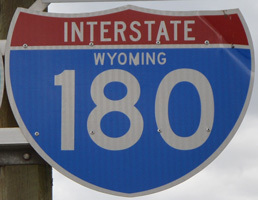 Interstate 180 is an urban arterial connecting I-80 with Downtown Cheyenne. It represents the only signed route within the Interstate Highway System that is not a limited access highway; unsigned Interstates in Alaska and Puerto Rico also include at-grade roads. Cosigned with Business Loop I-25, U.S. 85 and U.S. 87 Business, two grade separations and five signalized intersections line I-180 north from a diamond interchange with Interstate 80 to Business Loop I-80 & U.S. 30 (16th Street / Lincolnway) in the Cheyenne central business district. I-180 splits into separate roadways across viaducts spanning the Union Pacific Railroad yards. An improved connection to the Cheyenne central business district became necessary once the location for Interstate 80 was selected. Included in the 1965 Cheyenne Area Transportation Plan, three corridors were analyzed during the development of Interstate 180. The Central Avenue Corridor was selected because it provided direct access to Downtown. The other corridors considered were one leading northwest from I-80 to the vicinity of Missile Drive and another dog legging east from I-80 to U.S. 30 near the Norris Viaduct. One block and two block wide alignments were studied and three grade concepts were considered for the freeway. The below grade concept included tunnels under the Union Pacific Railroad (UPRR) yards. However due to high ground water table and numerous utility lines in the project area, the depressed grade concept was dropped. The at-grade proposal required bridge structures for side streets and pedestrians. The large number of structures needed to accommodate the sloped approaches for these spans resulted in this option being discontinued. Interstate 80 east from the Central Avenue Interchange with U.S. 85/87 was not completed until 1977. Options considered for modifying the half opened diamond interchange with Central Avenue for I-180 included a full cloverleaf, a folded diamond, and a directional interchange. The directional interchange was discarded due to terrain conditions at the site. A new viaduct connecting with the Central Avenue/Warren Avenue couplet was included in the 1965 recommended transportation plan for the Cheyenne Urban Area. Traffic volumes were high enough that a four lane facility was required. The Wyoming State Highway Department requested Interstate status for the improvement on November 27, 1967. Received on February 2, 1968, the new facility was to be a limited access highway with no at-grade intersections.1 I-180 was added to the Interstate system by the American Association of State Highway Officials (AASHO) on June 30, 1970. A subsequent corridor study evaluated how to build the improvement at a lower cost while still serving public needs. A report on the study was submitted to the FHWA on February 11, 1971. The facility was redesigned from a fully access controlled freeway into an expressway permitting access at designated points. The change was made on assumptions that full control of access and a free flow interchange at the south end would not be required, building an elevated structure was cost prohititive and that it would be uneconomical to purchase a two block area for right of way. Construct the facility as an at-grade, controlled access expressway south of the UPRR yards with access limited to two major street intersections. Modify the existing Central Avenue Interchange by adding a free flow right turn lane from I-80 west to I-180 north. Provide signalized intersections at 5th and 9th Streets. Repurpose Central and Warren Avenues as service roads. Build an elevated structure over the UPRR yards that diverges with one branch to Central Avenue at 16th Street and the other at Warren Avenue at 16th Street. Landscaping the right of way. The I-180, Cheyenne Interstate Spur: Environmental Impact Statement (EIS) submitted on April 14, 1975 indicated that the Wyoming State Highway Department intended to start construction in 1978 and finish work in 1984. Covered by Federal-aid Interstate funds matching state funds, costs were estimated at $14.25 million. Interstate 180 lowers from the UPRR viaduct onto Warren Avenue at Business Loop I-80 & U.S. 30 (Lincolnway). Photo taken 08/11/16. 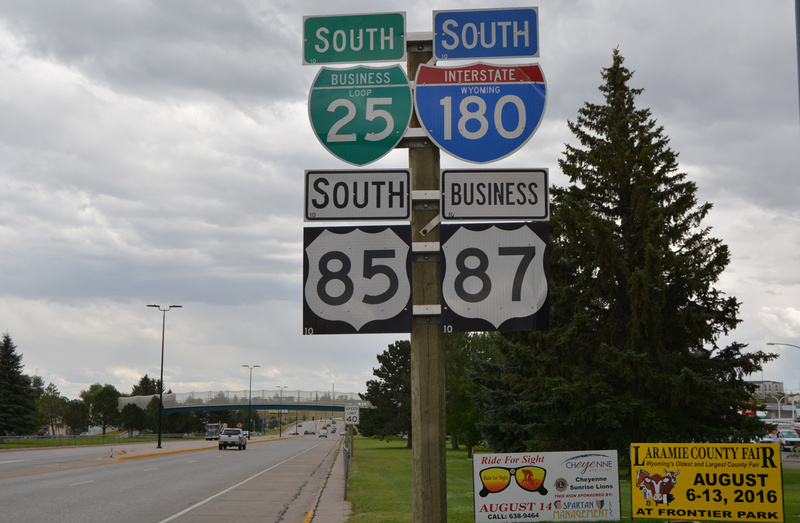 Business Loop I-25 & U.S. 85 follow Warren Avenue north from the end of I-180 to Cheyenne Regional Airport (CYS). Warren Avenue merges with Central Avenue northwest along Sloan Lake to Interstate 25. Photo taken 08/11/16. Overhead signage at Warren and 16th Street formerly referenced Pine Bluffs for Business Loop I-80 and U.S. 30 east from Downtown Cheyenne. Photo taken by Dale Sanderson (04/01). Business Loop I-25 & U.S. 85-87 Business rise onto the UPRR viaduct from Business Loop I-80 & U.S. 30 (Lincolnway) as southbound Interstate 180 begins. Photo taken 08/11/16. 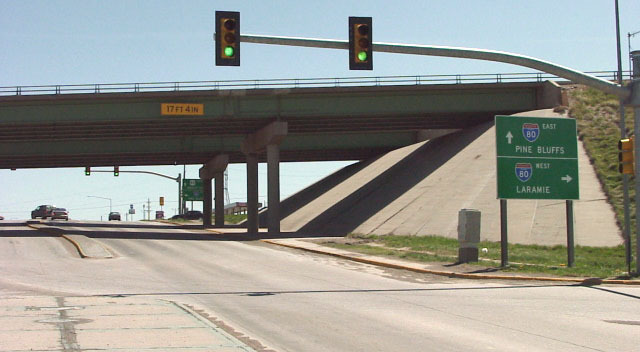 Older overheads at I-180 and U.S. 30 referenced U.S. 87, which bypasses Cheyenne to the west along side Interstate 25. Photo taken by Dale Sanderson (04/01). Business Loop I-80 & U.S. 30 (Lincolnway) eastbound at Central Avenue and the turn for Interstate 180 south. Photo taken 08/15/13. Replaced overhead along Lincolnway east for I-180 south referencing Denver. Photo taken by Dale Sanderson (04/01). Business Loop I-25 continues eight blocks north from I-180 and U.S. 30 (Lincolnway) to 24th Street near the Wyoming State Capital Building. Photo taken 08/15/13. Lincolnway / 16th Street west at the north end of the I-180 viaduct spanning the UPRR. The expressway south begins in one block. Photo taken 08/15/13. Torrington and Wheatland were referenced at U.S. 30 and I-180/Business Loop I-25 (Warren Avenue) northbound for the continuation of U.S. 85 and 87 beyond Cheyenne. Photo taken by Dale Sanderson (04/01). Westbound Business Loop I-80 and U.S. 30 at Interstate 180, Business Loop I-25, U.S. 85-87 Business (Central Avenue). Photo taken 08/15/13. Interstate 80 heads east fromm a cloverleaf interchange with I-25 & U.S. 87 through residential areas of south Cheyenne to meet I-180 & U.S. 85 (Central Avenue) in one mile. Photo taken 08/11/16. Entering the diamond interchange (Exit 362) with Interstate 180 north, Business Loop I-25 and U.S. 85-87 Business (Central Avenue). Photo taken 08/11/16. One mile east of the diamond interchange (Exit 362) with I-180, Business Loop I-25, U.S. 85-87 Business (Central Avenue) on westbound Interstate 80. The freeway parallels Crow Creek west from WYO 212 (South College Drive) to Central Avenue. Photo taken 08/11/16. Interstate 80 west at the south end of I-180 (Central Avenue). The Cheyenne central business district lies 1.1 miles to the north. Photo taken 08/11/16. 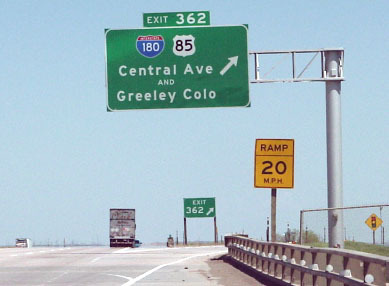 U.S. 85 extends south from Interstate 180 and Cheyenne to Greeley, Colorado. Business Loop I-25 and U.S. 87 Business accompany the route between WYO 212 (West College Drive) and Downtown Cheyenne. Photo taken 08/11/16. Photo taken 08/11/16. I-180 and U.S. 85 cross over Deming Drive leading into the exchange with Interstate 80. Photo taken 08/11/16. Interstate 80 travels west from Cheyenne to Laramie and Rock Springs. Photo taken 08/11/16. Sidney, Nebraska lies 100 miles east of the forthcoming entrance ramp to Interstate 80. Photo taken 08/11/16. Interstate 180 ends at the signalized ramps for I-80. Interstate 80 meets I-25 & U.S. 87 west in 2.5 miles. Photo taken 08/11/16. U.S. 85-87 Business and Business Loop I-25 follow U.S. 85 (Greeley Highway) south another 1.1 miles to College Drive. The two routes conclude at a diverging diamond interchange (DDI) with I-25 & U.S. 87, 3.8 miles to the southwest. Photo taken 08/11/16. Interstate 180 commences northbound from the south side ramps with I-80 along Central Avenue. 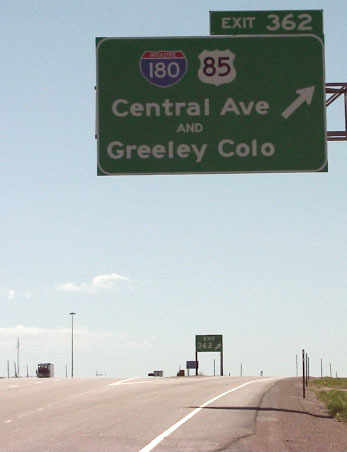 I-80 generally bypasses Cheyenne and runs along the north side of suburban areas and the South Greeley community. Photo taken 08/11/16. 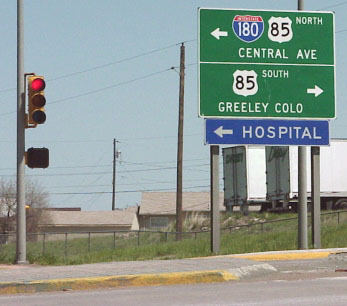 The westbound on-ramp to I-80 from Central Avenue references U.S. 30, which follows 16th Street / Lincolnway through Downtown Cheyenne ahead. Photo taken 08/11/16. 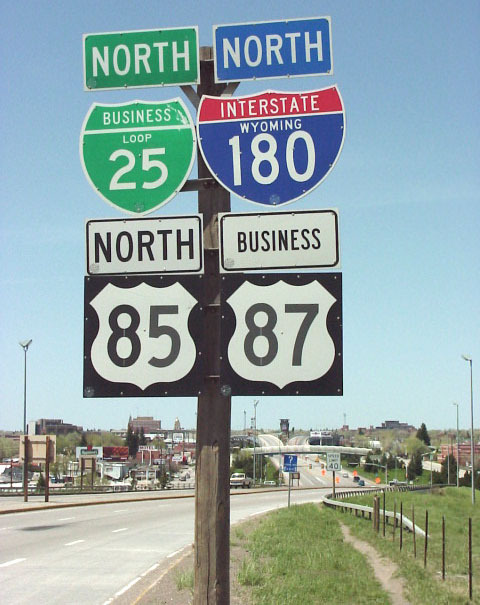 Confirming markers for Interstate 180, Business Loop I-25, U.S. 85-87 Business stand ahead of the Deming Drive underpass and signalized intersection with 5th Street. Photo taken 08/11/16. April 2001 photos from Dale Sanderson showing the diamond interchange joining Interstate 80 with the south end of I-180. I-180, Cheyenne Interstate Spur: Draft Environmental Impact Statement. U.S. Department of Transportation, Federal Highway Administration and Wyoming State Highway Department. April 14, 1975. Burrows, Bruce. WyoDOT Public Affairs Officer.